Your property is your investment and you can depend on us to be there each week. We will provide a scheduled day and we will be there on that day every week (inclement weather may affect schedule). You do not need to be home. Our crew will cut and trim your lawn weekly, and edge all hard surfaces every week. We always take away the clippings! There are several factors that need to be thought of to obtain the Lawn you want. Some of these thoughts should include proper mowing, trimming of excess grass from buildings, sidewalks, and driveways. 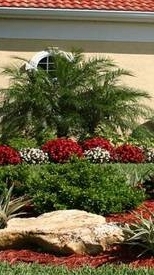 We must also give consideration to seasonal fertilizing, proper watering practices, mulching, and over seeding. Our local lawn care experts leverage their knowledge of your specific area and environment to create a residential lawn care program tailored to your needs. Let Green Day Landscaping & Lawn Care be your Residential Lawn Care Company of choice. Early spring crabgrass preventer may be used which helps build a greener, thicker Lawn.